Jamie Oliver Food Revolution 2 and yummy school lunch! Bring on the reality TV! 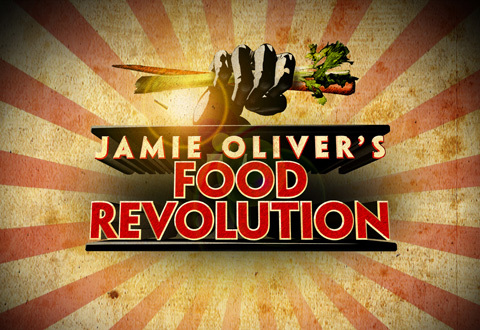 Tonight is the season premiere of Jamie Oliver’s Food Revolution, Season TWO! It will be on ABC 8/7c. To get a sneak peak of what to expect this season, you can visit ABC’s Food Revolution’s official website and watch a cool video. These past two days I’ve been attending Mom Congress in DC and you know what? The Food Revolution team (unfortunately without Jamie) arrived here and presented some amazing information about school lunch and then followed it up with a terrific brainstorming breakout session. Everyone in that group came away with actionable steps to reform school lunch. Here’s a picture I took…..YUM! Now the portion above is NOT a school lunch portion. We were told that kids would get one piece of chicken and broccoli or carrots. We were also given the recipes for everything except the rice and all the moms raved about the whole lunch including the rice! It was terrific lunch and it gave a lot of us hope about what could be possible. Considering recent news about a school banning home lunches, would you object to your child being told this is their only lunch option? Even my son and I could eat this meal with our dietary restrictions (new readers: my son went gluten and dairy free about six months ago and after my year of school lunches ended, I went gluten and dairy free). Because I’m at the Mom Congress, I’m going to miss out on watching tonight’s season premiere (and live tweeting it like I normally do). I’m super bummed, but I’m hoping it’s rebroadcast later this week. However, the Food Revolution team will be hosting a Twitter party on Wednesday night (tomorrow) at 7PM PST (Pacific time). Jamie Oliver will be there and everyone will be chatting using the hashtag #foodrevparty. Join us for a fantastic chat and maybe those of you looking for more actionable items get gather information and answers on Twitter. I’m going to be using http://www.tweetgrid.com/ to follow the action. I can't wait to watch the season premiere. I don't like the idea of mandatory lunch for a few reasons….1. allergies/sensitivities make planning a meal for 20, let alone 200 very difficult. 2. I have yet to see a school lunch in my district that looks anything like this. 3. Even in a group of "educated" parents, folks have differences of opinion on what's healthy. Who gets to decide? 4. Finally, while there is a ton of attention being paid to obesity….the rates of underweight/undernourished children is increasing as well….for those children, maximizing nutrition, and calorie density is key to keeping them healthy…and those individual needs cannot be met adequately by a one-size fits all lunch system. I'm not speaking only theoretically….I have 1 daughter who is regularly "falling off the bottom" of the growth chart with each growth spurt..and it's a real fight to make every mouthful count…she very much follows her father's growth patterns. My other daughter is "at risk of obesity" at the 87%, and follows more of my family's tendancies towards obesity. It's near impossible to meet both extremes needs within a family of 4….add in another family with food allergies, or religious preferences…and I can spend hours trying to meal plan something that will come close to meeting everyone's requirements. I would never eat this lunch. I cannot stand chicken with bones, or dark meat chicken, or chicken skin. I know I am picky, but as soon as I scrolled down, my stomach started churning. Sorry. that looks better than my dinner! I assume the $0.80/plate is ingredients, not labor? You should be able to watch it at abc.com or using the abc app on an iPad. I'm not sure if there are apps for droid though. I have to agree that t may be difficult to address every child's allergies, but at most schools, a doctor's note should allow that child to bring in a home packed lunch. I have two kids that are underweight. My daughter eats a myriad of food. 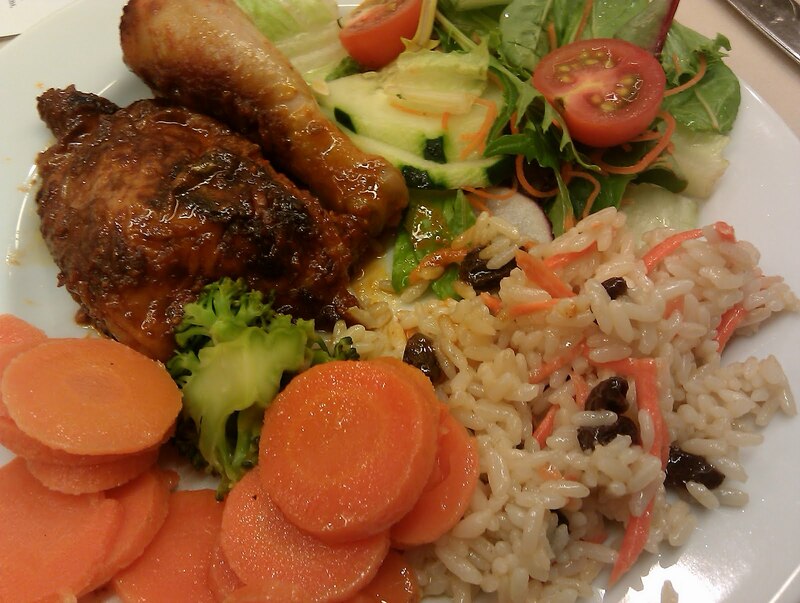 I try to have a variety of colorful foods on our plates for every meal eaten at home. However, she does enjoy school lunch twice a week. I'm not thrilled about it, but do like to give her choices too. For religious reasons, there are days she absolutely cannot buy. She is fine with that. With that said, I would love to see my daughter eat a plate of food like the one you were served. My daughter would eat it all. She has no known allergies. My son on the other hand has difficulty with textures and would never eat that. But he has a doctor's note that would exempt him while we desensitize his mouth and his eyes. Since for him to try any new food, it as to appeal to him visually. Oh, I forgot to mention, both my kids are on the spectrum. We don't eat meat, so if that were the only lunch available, my daughter would still be starving afterward. Unless they offered a vegetarian option every day (wouldn't have to be a whole separate lunch, just something different to go with the same sides) I would be desperately seeking an exemption. That meals looks absolutely mouth watering. Reminds me of the project that a fellow dietetic intern did with the Seattle public schools 4-5yrs back. She made the most amazing dishes that fell into the per person budget of less that a dollar. She had rice/noodles loaded with vegetables and meat and I remember the yummiest lasagna (meat and veg version) I ever had till date. I know it could be done…just a little bit more work involved…but I guess, schools are much more interested just in doing it the conveyor belt way. Well, of course I would object to that being my "only option", and I'd be offended, too. I would not want my children eating that meal. We are vegetarian, and don't eat dead animals, thank you very much. Sorry, I'm all for healthy eating, but I'm very much against bureaucratic and government tyranny. Of course kids should have healthy breakfasts, lunches and dinners, but they should never be forced to eat things they don't want to or face starvation. That borders on abuse, to be honest. Healthy or not isn't the issue many are objecting to, it's the idea of being expected to subscribe to one set of beliefs about food that may or may not be your own. Doctor's notes are all well and good if your kid has an actual medical issue, but what if you just don't buy into whichever version of "healthy food" is being touted this week? What if you're like me, and believe strongly for health and ethical reasons in all chemical free, all local, all sustainable food? There's no doctor's note for "don't want to eat meat raised in factory farm conditions". This looks fantastic! Would I object to this being served? Yes and No. I would not object to this meal, what I object to, is not being given an option. Say no to junk food and soda, but don't take everything away. If my choice was ever taken away, you bet I would be taking my child to another school! Over lunch? No, over choice! Yes, I would still object based on the economics of 3 kids in school who have to pay full price for lunch already. I'm assuming that lunch would actually cost around $2.50 per student to cover labor, misc costs (electricity), and to subsidize those students who qualify for free or reduced meals. Our school utilizes a catering service and I hear the food is pretty good. But, I still pack lunch every day because it is cheaper. We have no dietary restrictions or other issues. That lunch looks fantastic. I'd sure eat that, and it's pretty much what I strive to provide at dinner time for my kids–protein, a starch, and a veggie medley. I lurrrrv Jamie Oliver. I like that he brings attention to the ammoniated garbage that American ground beef is allowed to contain. He is also right to question the practice of schools nuking their pre-packaged offerings right inside the plastic packaging. I would NEVER do that. I don't necessarily object to the lunch, it looks great! But my son would end up only eating cucumber, tomatoes and chicken. He doesn't like broccoli, not a fan of carrots and rarely eats rice. Does that make him an unhealthy eater? No. He loves fruits and other veggies just doesn't care for those. I guess that is where my problem with the 'you have to eat this for lunch' comes in at. If there were say 2 healthy lunch choices instead of just one I would be more apt to agree with it. Until then I will just keep packing him his tuna salad w/ whole wheat pasta and cherry tomatoes, organic yogurt and juice to drink.